I have an engagement session this weekend & as I was preparing for it I couldn't help but go back to this inspiration session I photographed for the venue that the brides will be getting married at! The Southern Theatre's mission is to foster a community of exceptional artists & this amazing theatre couldn't be a better place for just that! 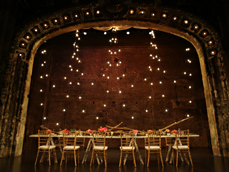 In addition to proving the perfect backdrop for musicals, plays, one acts, dance shows, comics & more this theatre is also available for your wedding! I was very lucky to be able to work with some amazing vendors & models who really brought this inspiration session to life! June can't get here soon enough! Enjoy!